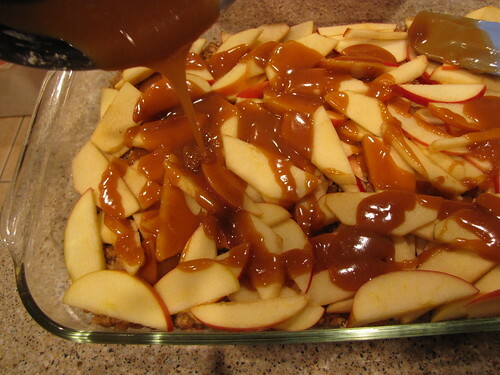 Caramel Apple Bars are wickedly good. If I was any kind of food photographer, you’d have a photo deserving of their awesomeness rather than 3 brown squares on a plate. 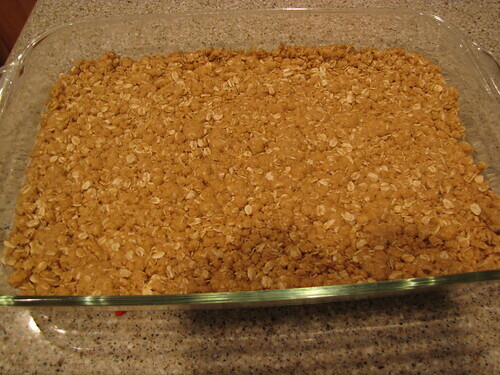 However, 3 brown squares on a plate is what you get when you are TOO DISTRACTED by the smell of the Caramel Apple Bars to even think about taking more than one photo. So, what I lack in food styling, I will more than make up for in flavor and ease because these are not only supremely delicious, they are also quick and painless to make. You don’t even need a mixer to make these. 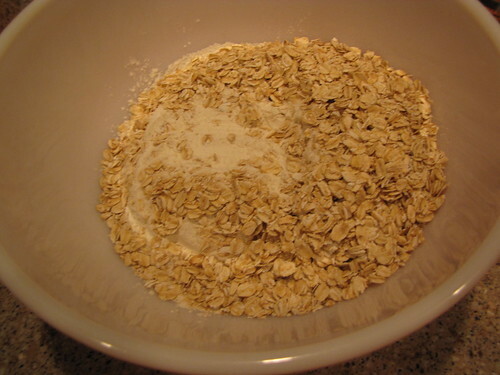 Just grab a big bowl and add 2 cups of flour and 2 cups of oats. I’m using old fashioned oats but the original recipe calls for quick cooking oats. The only difference here is a bit of texture. The old fashioned will be a bit crunchier, which I like. 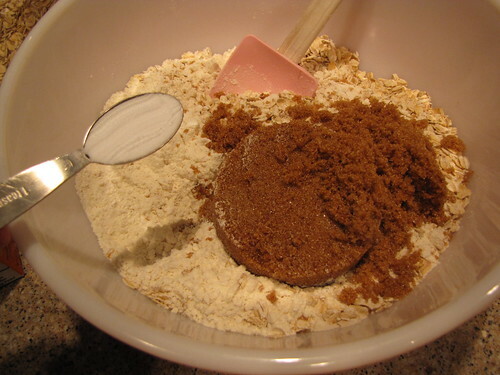 Add 1½ cups of lightly packed brown sugar and 1 teaspoon baking soda. 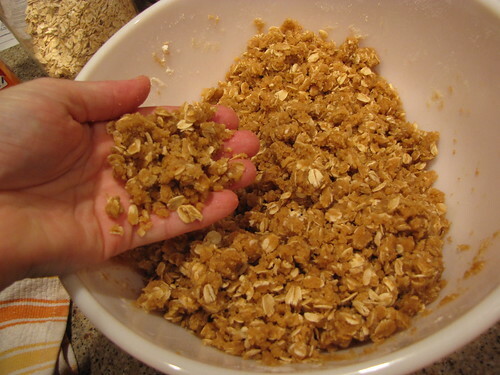 then ditch the spoon and give it a few turns with your clean hands so that you have a crumbly mixture. 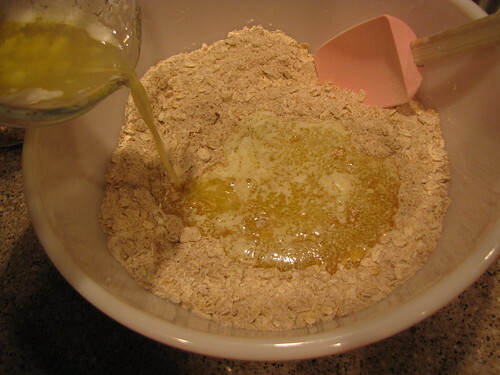 Set 2 cups of this mixture aside for the topping. 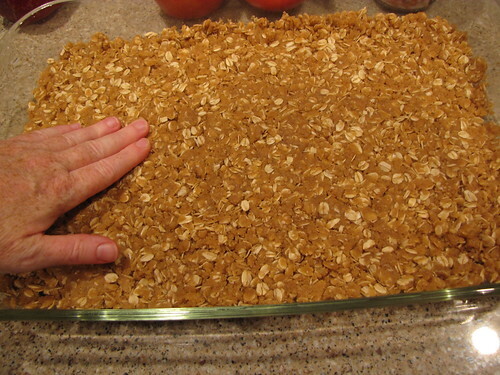 Press the remainder into the bottom of a 15×10 inch baking pan. I lightly sprayed my pan with cooking spray but honestly, these have enough butter that you probably don’t need to bother. 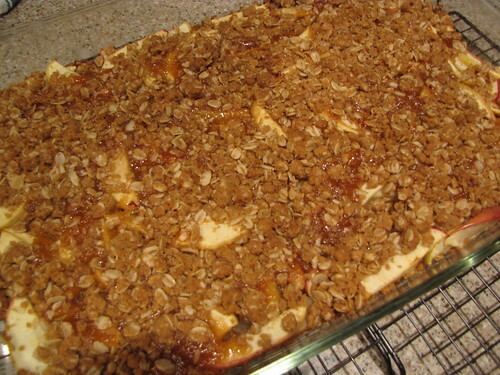 Also, if you don’t have a pan that large (it’s the extra big sized Pyrex), you can bake this in 2 smaller pans. 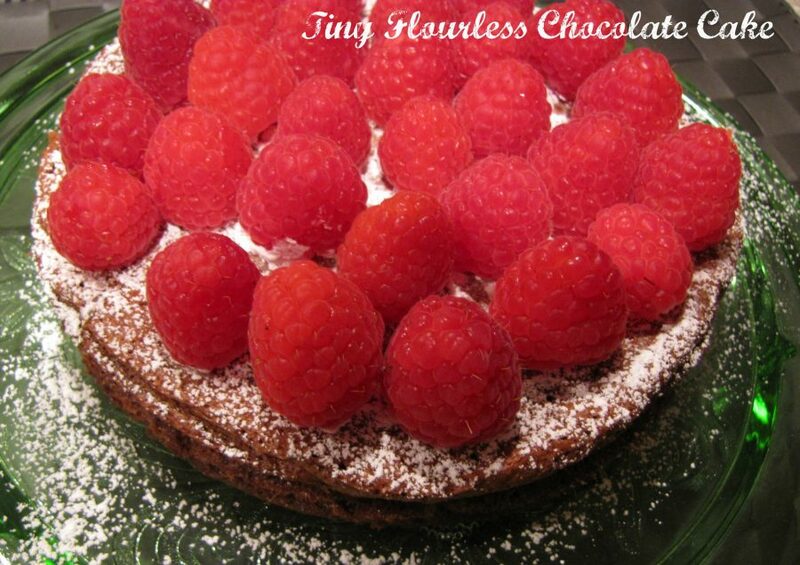 My friend Julie who gave me this recipe uses an 8×8 and a 9×12. Bake the crust in a 350 degree oven for 8 minutes. 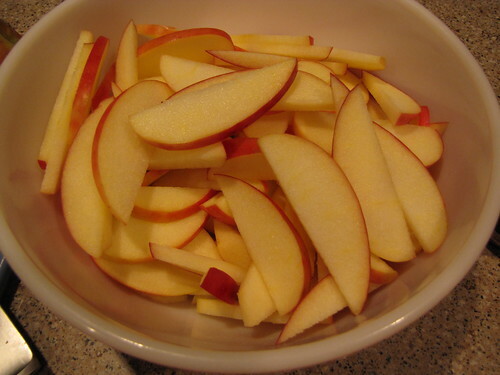 While the crust bakes, slice or chop 3 cups of good, tasty, firm apples. I used 4 fairly large apples. Try to choose seasonal apples with lots of flavor like Jonathans, Haralsons, McIntosh, or Honeycrisp. These apples are part of my stash that I bootleg back from my fall trips to Minnesota. I’m serious about my apples. As you can see, I’ve left the peel on most of the apples. A couple of the haralsons were a little weird looking so I peeled them but I like the additional color and texture from the apple peel. If you’re making this for kids, you might want to ditch the peel so they don’t freak out. Pour 1 (14 oz.) 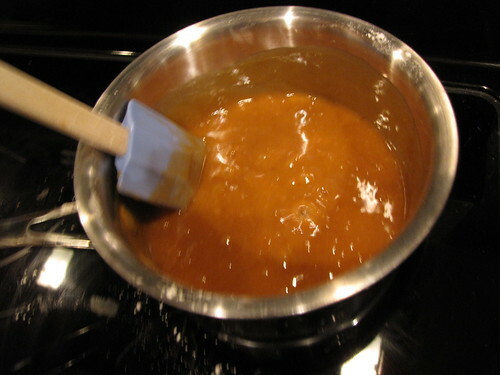 jar of caramel topping into a small sauce pan and stir in ½ cup of flour. I like the Hershey’s caramel for flavor and thickness. 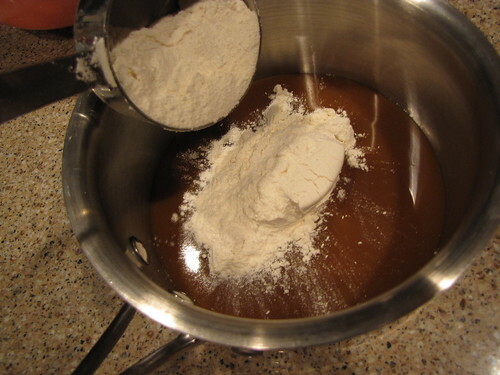 Cook the flour and caramel over medium high heat, stirring constantly, until it boils and thickens – about 3 minutes. 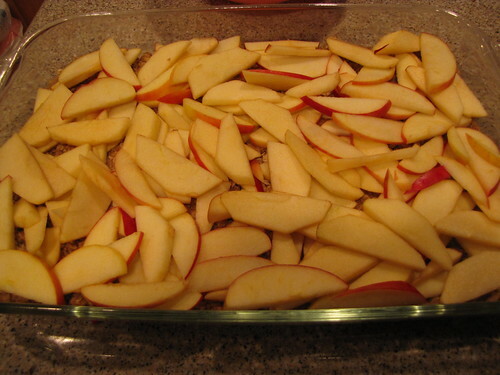 and top it with the sliced or chopped apples. 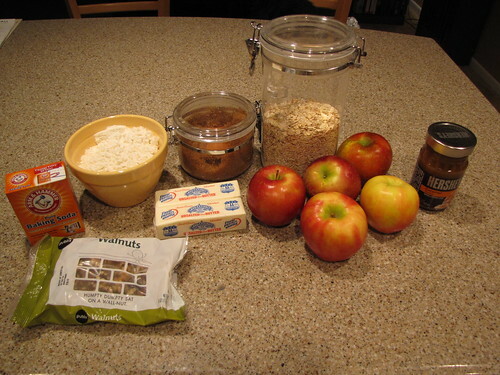 If you are using nuts, sprinkle ½ cup of chopped walnuts or pecans on top of the apples. I highly recommend adding the nuts but I left them out of this batch so I didn’t kill my friend Patrick who is allergic. 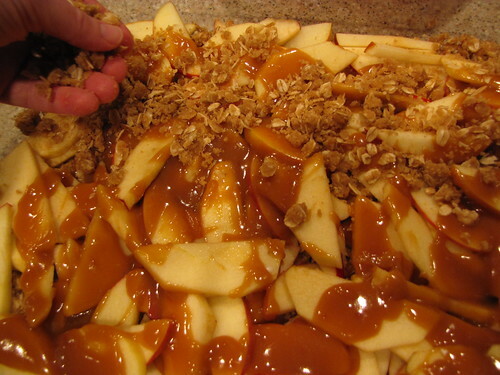 Pour the hot caramel sauce over the apples. It won’t completely cover them so just try to get a fairly even caramel layer drizzled over the top. Sprinkle the reserved crust mixture over the top. Bake at 350 degrees for 25-30 minutes until golden brown. Fair warning – this smells incredibly good while it cooks. Now for the hard part – place the pan on a wire rack and allow it to cool completely before cutting. Time to practice self control because they will fall apart if you cut them while still warm. These are SO good. 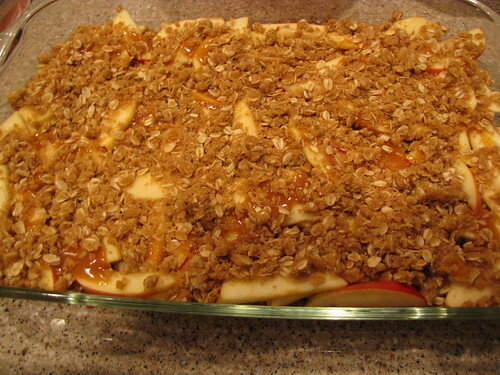 It’s sort of like apple crisp in a bar with the extra oomph of caramel sauce. 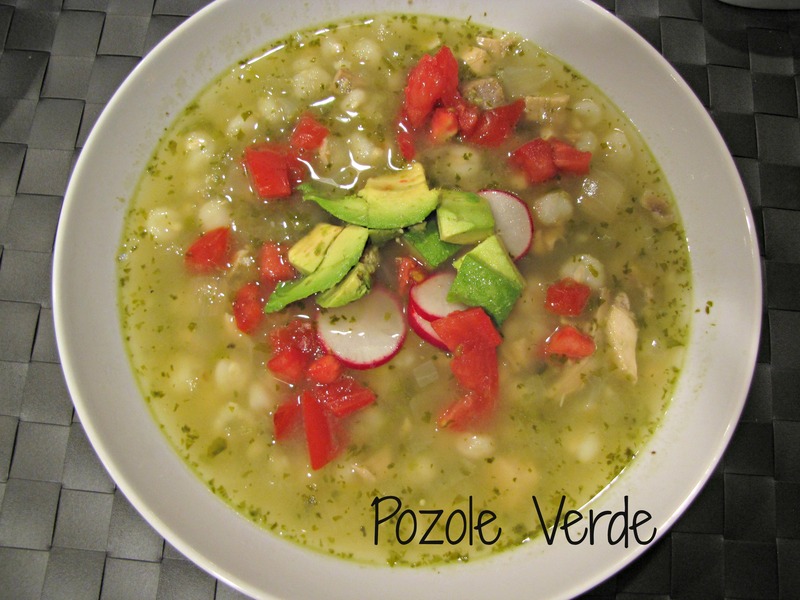 This recipe comes from my friend Julie Heller who is not only a great cook, but also runs agility with her awesome dogs! 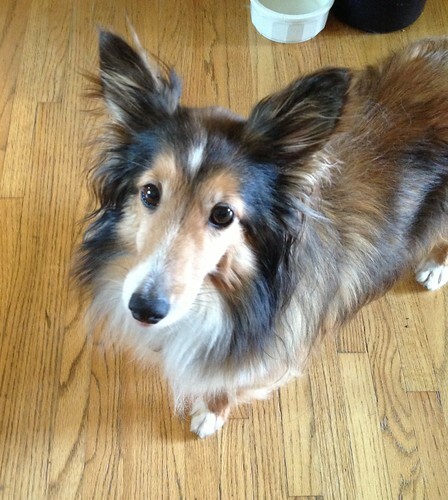 Check out Julie’s dog – the amazing flying Tari! I love this photo. You thought it was just about cats around here but the truth is that Julie is also a dog foster mom extraordinaire. I was VERRRRY close to trying to adopt Murphy one of her fosters, because really, who can resist these ears? Cute dogs, good friends, apple bars…something for everyone today! 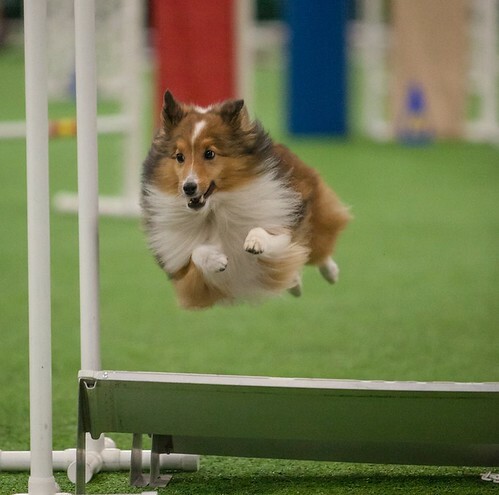 Julie got the recipe from her agility friend Lori Lonne and after a little searching on-line, it looks like the original might have come from Pillsbury. Gluten Free – I haven’t tried it yet, but I don’t see any reason why this wouldn’t work with a substitution of gluten free flour. I’ve never tried to make homemade caramel sauce but I totally understand your concerns with the “ingredients” listed. Let me do some digging…. Oh for the yum! 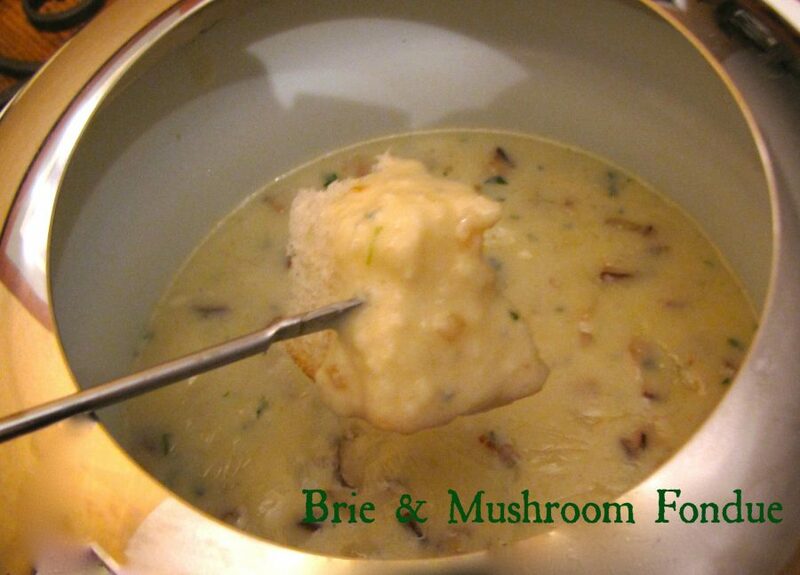 I’ve wanted the recipe for this one ever since you mentioned it….I think…on Gary’s blog. Do you think dulce de leche would work for the caramel? Hmmm…I’ve never cooked with dulce de leche but my guess is that it should work. You want it to be fairly thick but still pourable so you might have to add a bit more flour or cook it to thicken just a bit longer. Let me know how it goes! 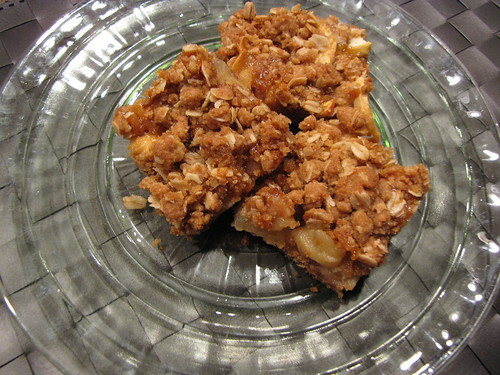 Claudia, I can happily testify to the deliciousness of these caramel apple bars. You were extremely kind and generous to make them and bring them for our starving musician colleagues to eat during the break between morning youth concerts. They are perfect with coffee. 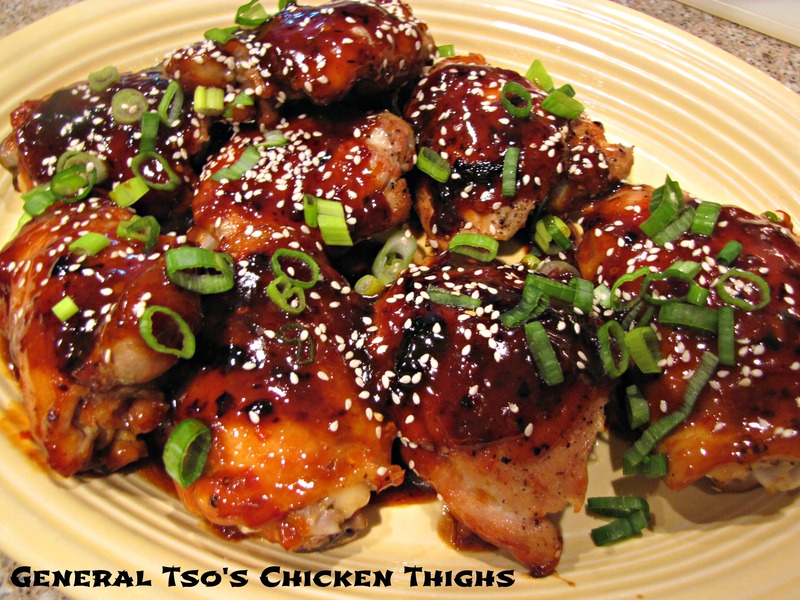 Folks, you have to make this recipe. It is SO GOOD! !